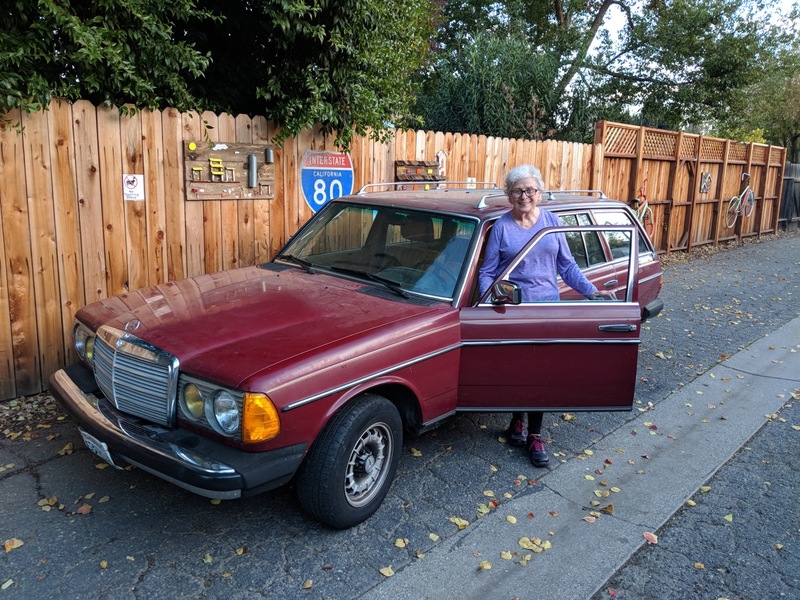 In 1987 my husband found a new-used Mercedes diesel station wagon for sale and convinced me that it would be a good car for me to drive on the California freeways—safe and solid. I had buyer’s remorse almost immediately. I didn’t like searching for stations that sold diesel—they were mostly truck stops—and I hated pumping that smelly, oily fuel. And then there was the noisy chug-chug of the diesel engine that made me feel like I was driving a truck. I just didn’t see myself as a Mercedes type of driver. Too showy and too foreign. In the lace curtain Irish neighborhood in the Bronx where I grew up, folks drove Detroit cars like Ford and Chevy, not high-end German autobahn vehicles. If I showed up behind the wheel of a Mercedes-Benz, they’d laugh me off the block. But the wagon was bought and paid for so I drove it—for more than thirty years and over 300,000 miles. Because we’ve lived in the same town all those years, I’ve come to be associated with my car. When my friends see the old burgundy Benz in the parking lot at the library, they know they’ll find me in the stacks. I can’t say when I learned to love my unique and reliable wagon, but I did. And it turned out Bill was right. When I drove around Northern California in my red wagon, I felt like I was riding in a tank—safe and secure. I drove it up to Seattle to visit a friend, and down to Tucson to see my cousin. Somewhere along the way I started calling my car Betsy. Bill and I often return to the car and find notes on the windshield from people offering to buy the classic wagon. When our granddaughter turned sixteen, we gave her the Benz because we wanted her to drive an armored car on the highways with the big trucks and SUVs whizzing by. Elly thanked us without any real enthusiasm. She hated the bulbous wagon as much as I had when it was new to me. And I wasn’t too happy with the fancy car we bought to replace it. So her parents let her choose her own car, and I got Betsy back in my garage. We still own the car, and though I no longer drive due to health concerns, I’ve been having a hard time parting with the old girl. But guess what? Elly has had a change of heart regarding the red wagon. Ten years after turning it down as a teenager, she and her husband would like to have the Mercedes for running around town and taking their dog to the beach. I’m happy to report that we’ll be keeping Betsy in the family. Dorothy is a native New Yorker who worked on Madison Avenue before moving west in 1961. On the Davis campus of the University of California she served as an editor and program director. Diagnosed with Parkinson’s disease in 2007, she often writes about the challenges of living with that condition.